Austin is home to three species of aquatic salamanders that occur no where else in the world except in and around this city: The Barton Springs Salamander, Austin Blind Salamander and Jollyville Plateau Salamander. 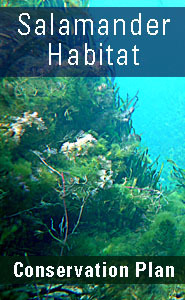 The Barton Springs and the Austin Blind salamanders are found only in the Barton Springs segment of the Edwards Aquifer and its contributing zone. The third species, the Jollyville Plateau Salamander, lives primarily in the springs and streams of northwest Austin and southern Williamson County. 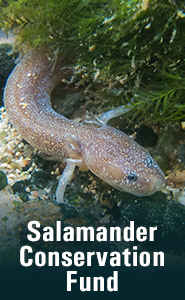 Under the U. S. Endangered Species Act, the Barton Springs Salamander and Austin Blind Salamander are endangered, and the Jollyville Plateau Salamander is threatened, because of the ever-increasing human impact on their habitats. Click here to learn more about proposed changes to Eliza Spring – that’s the sunken, fenced-off amphitheater area just outside of Barton Springs Pool. Click here to learn more about the 2018 sediment discharge incident. Read the City's water quality protection publications.